After reading a modern crime thriller (I am Pilgrim by Terry Hayes) I read two popular, non-fiction “lifestyle” books and I didn’t really love either of them as a reading experience. One was quite informative and interesting, the other was a bit too simplistic – I liked the idea, just didn’t like the execution. I probably shouldn’t expect to read those kind of books for pleasure anyway. 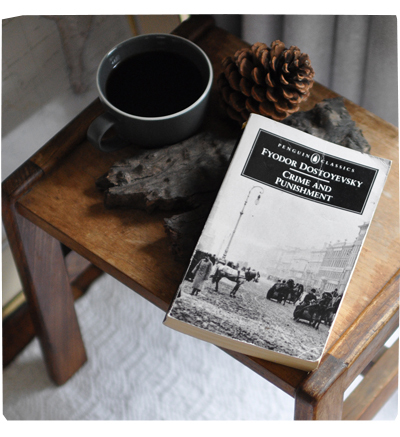 Thankfully I found Crime and Punishment by Fyodor Dostoyevsky in an op shop for $3 – yay. After reading Anna Karenina, I fell in love with 19th Century Russian literature and was keen to try more. Crime and Punishment was one of those books that was rated highly and constantly featured in lists like “100 Books you should read before you die”. Brilliant, deep, powerful, full of drama and insight into human nature. I was laughing out loud, dropping my jaw and gasping with delight. It was such an awesome read for me that I’m still thinking about it, weeks after I’ve finished it. It’s definitely one of the best books I’ve read. I’m now officially obsessed with Russian literature from the 19th Century and I desperately want to visit St Petersburg and Moscow! I’ve also ordered 2 other Russian classics and super excited to read them!